Faux- Filet de Bœuf "Tagliata"
PARC DES BASTIONS - La propriétaire initiale du restaurant était une comédienne de théâtre nommée Mademoiselle Dorian. Elle donna son nom de scène à cette brasserie cossue, au charme et au dynamisme très parisiens. LE MEILLEUR DES MONDES - De midi à minuit, la brigade vous prépare le meilleur des cuisines française, italienne et genevoise. S'y ajoute un menu différent chaque jour ainsi que 6 à 8 suggestions de mets typiques de brasserie. GROUPES - Idéal pour les repas privés, Le Dorian vous accueille dans son salon de dégustation. Et durant les beaux jours, vous pourrez déguster votre repas en terrasse. Idéal à la sortie d'un spectacle. Nice lunch and set up. The setting is nice, the service could be better (it sometimes gives the feeling that the employees were imported from a bothered Paris bistrot, people who have visited the average Parisian restaurant will understand my remark...), the tartare with foie gras was average and French fries spent a long time in oil... Nice setting. We booked a table for two following an evening concert. Seeing how we could be running late we phoned in advance and were politely told not to worry. indeed the artists sat on the table next to ours! It was still hunting season so I ordered the "Pavé de Cerf forestière" served with a generous portion of chanterelles and tagliattelle. The meat was cooked pink to perfection and the sauce was delicious. The Dorian salad was fine but not spectacular. Desserts on the other hand were mind-bogglingly outstanding. The "bonet piamontese" and the caramelized apple "mille-feuilles" cannot be missed! Service was impeccable and efficient. We will return. Great place to have a nice lunch..
Great place for a quick yet good meal if you’re running to catch a show or movie in the area. Cuisine is good though not overly creative or refined. Service is excellent. The Maître D is lovely and welcoming. 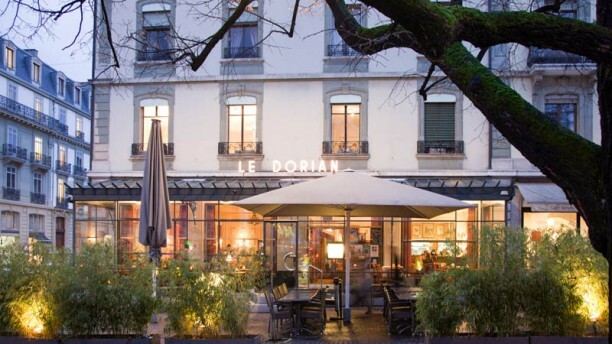 It's always a pleasure to eat at the Dorian. The food and service is consistently good. Recommended. Good food but a bit pricey. Best to come with a reduction! Specialising in after-concert suppers, the service was fast and friendly and the food and wine excellent. Our salad starters were very boring. The restaurant had run out of two of the main courses and my breaded veal was dry and the french fries were soggy. My friends pasta was very average. I've been living in Geneva for 5 years and must say that the service here was the best I've had so far. I went with my mom and she loved the food (fois gras as a starter and Nordic dish as a main). I'm vegetarian so had the mixed salad and fettuccine zaffara, but wish I would've ordered the rigatoni instead. The only reason I didn't give this a 10/10 is because my plates were mediocre. It's definitely worth going back to just because the discount you get with the fork makes it good value for money. Très bon repas. très bon service. Good food and a nice table in the glassed-in terrace, which is warm and cozy. The service was slow - I think there was only one waiter - but it was a dinner with friends so we weren't in a hurry. We were told that The Fork discount didn't cover everything on the menu - a few high value dishes were not covered, which wasn't clear when we booked. None the less, five out of six of us benefited from the discount with helped keep the price to 50SF per person for two courses and some drinks. Overall, recommended.